„Klofalækjarkjaftur“ - can you pronounce these Icelandic place names? A map published by writer Alda Sigmundsdóttir on her personal Facebook page has been widely shared in the past few days. It contains some of the most bizarre, and unpronounceable place names of Iceland. Fancy a try? The photo was found by Sigmundsdóttir on Reddit. "The only thing I did was reading the place names aloud." 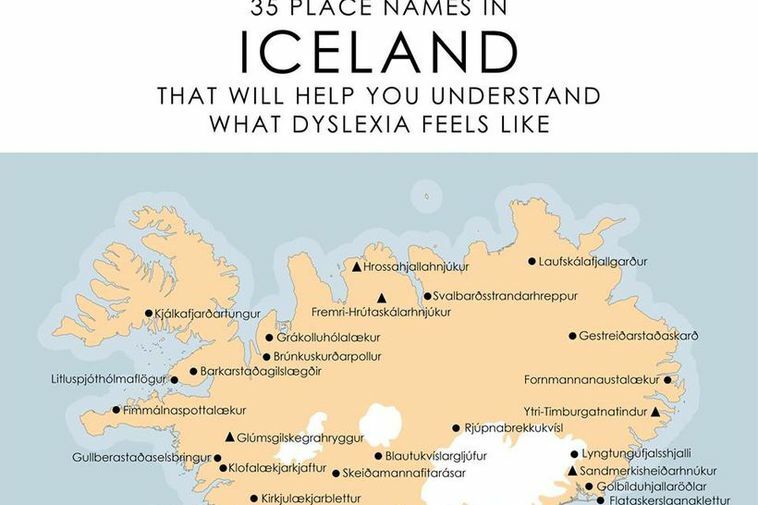 Reading out the names is probably difficult, even for an Icelander. "I'm quite bewildered by all the attention that this got," says Sigmundsdóttir speaking to mbl.is. According to etymologist Hallgrímur Jökull Ámundason these placenames all exist and can be found on the website of the National Land Survey of Iceland. However, there are two small mistakes on the map. The name Lyngtungufjalshjalli should be Lyngtungnafjallshjalli, and Litluspjótahólmaflögur doesn't exist. There is however a Spjótahólmaflaga almost in the same spot.